This guide aims to help you revert Windows 10 from its Anniversary Update. The steps below will show you exactly how to do that. Since you are reading this, you have probably received the Windows 10 Anniversary Update, however, the reason to be on this page is that you are probably looking on how to revert it. There might simply be some modifications that you can’t get used to and are causing more disturbance rather than ease of use. The good thing is that you are not the only one who wants to go back to the good old 1511 version. In case you are wondering how you can do that, here is a guide that will show you two major methods that can fix this. 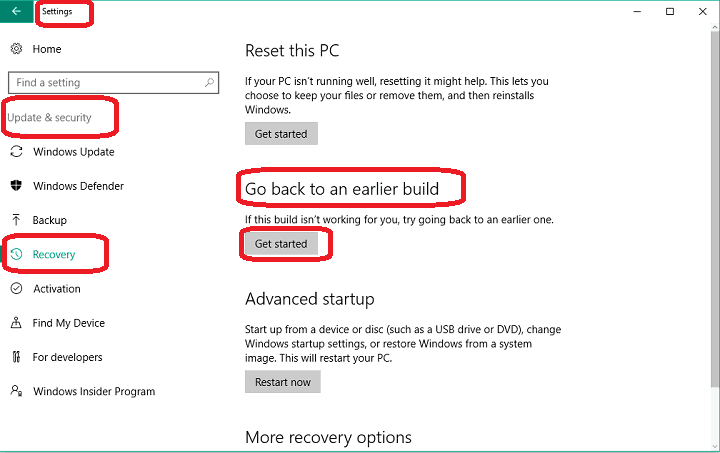 In fact, Windows 10 itself offers a reset option to the previous build, and you can easily take advantage of it. The good thing is that even if, at some point, you decide to update to the Anniversary Update again, that could easily be done with the help of the ISO files. The first method is to revert to the previous Windows 10 build. Microsoft will ask you to provide feedback on why you decided to go back to the previous version. Generally, you can say anything there, and simply click the checkbox that is applies to you and click “Next”. Once the feedback is sent, you may be prompted to check for updates. Simply click on “No thanks” and proceed with the process. When the process is over, you will automatically get back to version 1511 of Windows 10. This is the easiest way to uninstall the Anniversary update. In case that you, for some reason, face some difficulty performing the build in the downgrade process, there is also another way to restore the previous version by using the Advanced startup. In some cases, the Anniversary Update may cause some issues with your computer performance such as trouble with booting or other system incompatibilities which you may like to fix. Your attempts to solve them could also be a reason for you to decide to go back to version 1511. Using the Advanced Startup may help you in case you are not able to boot to Desktop. For that, however, you will need to have a bootable media. If you have one, (which you may have created earlier with Microsoft’s November Update ISO files) you will easily uninstall the Anniversary Update. But if you don’t have a bootable media with version 1511, that won’t be possible and you may need to keep the latest updates to version 1607. Boot your device and Access Advanced Options. The restoration process to the previous version should begin. That is all. 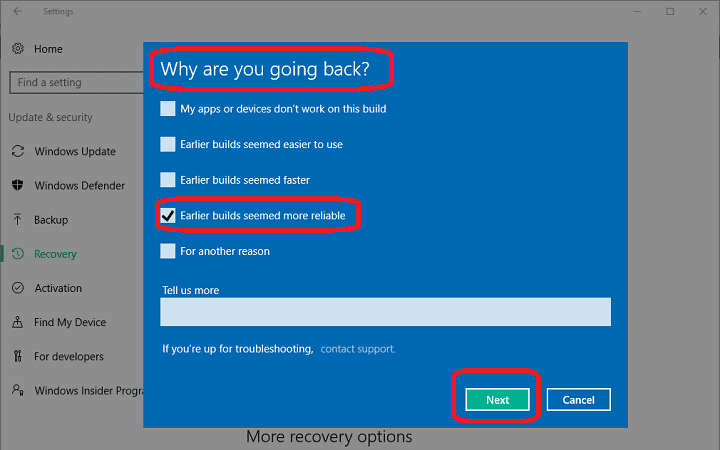 We hope these two options will help you get back your older Windows 10 version and help you solve the issues or bugs you may be facing with the new update. Feel free to share with us which method worked out for you in the comments below and why you decided to give up on the Windows 10 Anniversary Update.